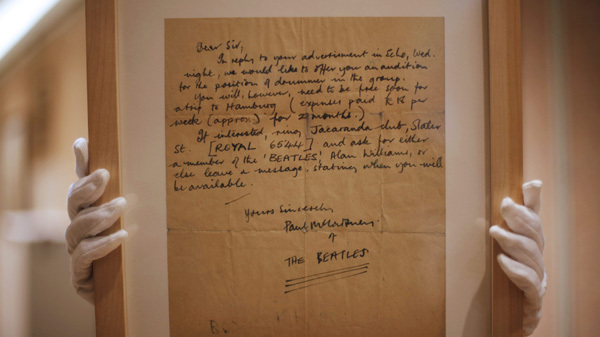 Letters containing insults like “GET OFF YOUR GOLD DISC AND FLY!,” like the one drafted by John Lennon to send to Linda and Paul McCartney (currently up for bid at Boston’s RR Auction), were... Paul, I think your open letter to Sir Paul McCartney may have had some effect. I just saw this update on Amazon USA (copied and pasted hereto), indicating a 5th disc of B-sides is included in the “Flowers in the Dirt” SDE, excepting 3 cassette demos, which are available as downloads as stated in the product description. The stock photo of the box set still shows 3 CDs and 1 DVD. The lyric is: "I'm gonna sit right down and write myself a letter and make believe it came from you/I'm gonna write words oh so sweet/A lot of kisses on the bottom/I'll be glad I got 'em." McCartney admitted to London's Sunday Times that his love of "mischief" led him to pick the controversial title. how to send a gif by email The Beatles or more specifically, Paul McCartney, started work on the song Let It Be during their recording sessions in January 1969. So, perhaps he had the song composed by l … ate '68 and only showed it to the group in 1/69. RR has put up for sale a 1971 letter that the late John Lennon drafted and hand-annotated (but never sent) to his former bandmate, Paul McCartney, and McCartney’s then wife of two years, Linda. In 1971, John Lennon wrote the following scathing missive to Paul and Linda McCartney in response to a letter from Linda in which she had chastised him for, amongst other things, not publicly announcing his departure from The Beatles. A letter written by an angry John Lennon to Paul McCartney and his wife Linda is going up for auction. The Beatles or more specifically, Paul McCartney, started work on the song Let It Be during their recording sessions in January 1969. So, perhaps he had the song composed by l … ate '68 and only showed it to the group in 1/69.